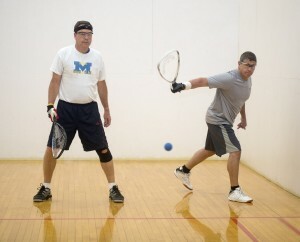 The Saginaw Family YMCA offers three beautiful courts for racquetball, paddleball, handball and wallyball! These fast paced, exciting activities are fun for members of any age. It is an excellent way to meet new people and sharpen skills. More than a game, these court sports incorporate agility, speed and power. Y-Members, there is not a court usage fee during non-league times. There is now a simple court reservation page on the bulletin board in the courts area. The page will be updated monthly. Reservation expires if not on the court within 10 minutes. You will see some program reservations pre-populated. You may just write in your request for another time, or ask how you can join the players in the program! Non-League usage is for our members only. A Guest Pass makes you a member for the entire day. Or register for Challenge Court s to play. Some loaner equipment is available at the front desk. Eye protection and wrist lanyards are recommended. For those looking to sharpen their skills in a fun game situation. All participants should pre-register online or stop at the front desk to register. We host National Paddleball Association Tournaments several times a year.